Every girl loves a little bling on her birthday....even if it comes on a card instead of a piece of jewelry! 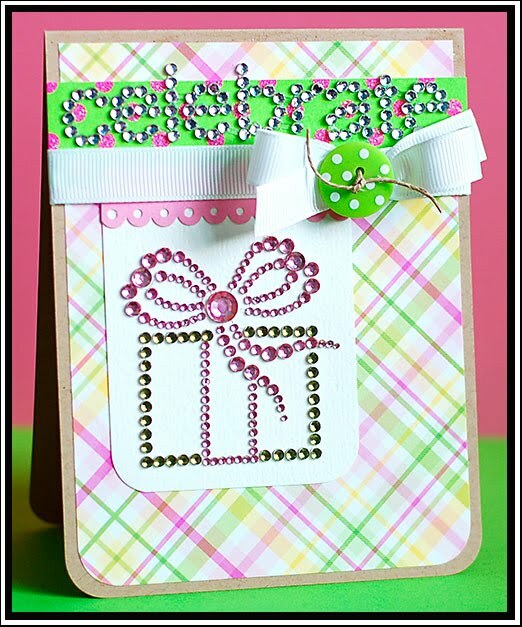 :) The first card I have to share with you today has a big focus on pretty jewels, which is the current challenge at Jacksonbelle Embellishments. It is also based on Mojo Monday sketch 121. Instructions: Round the bottom corners of a kraft colored card base. Round the bottom corners of block of plaid paper and adhere to the front. Cut a strip of dotted glitter paper, and adhere towards the top. Round the bottom corners of a block of white cardstock, and adhere to the front. Attach a scalloped paper frill to the seam. Cover the seam with white ribbon, and tie a button around the bow with twine. Add the jewels present to the white block, and the jewel sentiment to the top strip. And I have one more card to share today! It isn't completely birthday themed, but it is baby themed....which is kind-of celebrating a birthday in a way! So, I figured it still fits a bit. This card is based on Laura's Sketch 43 at 2 Sketches 4 U this week. Lovely sketch this week! Instructions: Round the bottom corners of a white card base. Round the bottom corners of a block of aqua striped paper and adhere to the front. Cut baby feet card at 5" from heart kraft paper using a Cricut and New Arrivals cartridge. Cut 3/8" off each side, and cover the cutout inside with white cardstock. Adhere the block to the front. Add a strip of ribbon down the center, cutting it off right before the baby feet. Cut the sentiment block at 3" using patterned paper & kraft cardstock using a Cricut and Storybook cartridge. Layer the cuts together, popping the top layer with dimensional adhesive. Adhere the sentiment block to the front, and accent with pearls. Top the sentiment block with a bow. If you checked out my rainbow card post from yesterday, I actually ended up changing it. I decided I didn't like how the sentiment looked, so I picked a new one and redid it. It looks much better now....and I have added a new photo to that post. Check it out if you like! Do you sell your cards? Soooo cute! And the cards are lovely too (LOL). Thanks for your super sweet comments on my blog. I took some time to see your older posts. Love your style. Love your cards! What a great blog you have here. Thanks for playing along with our challenge! Your blinged out birthday card rocks! thanks for the nice comments on my blog! first off i have to say that i LOVE the name of your blog (i'm a huge fan of cupcakes!) second, your cards are amazing! i love the bright colors and all the little details! i will definately be dropping by again! Yeah Lea! I am loving the bling! 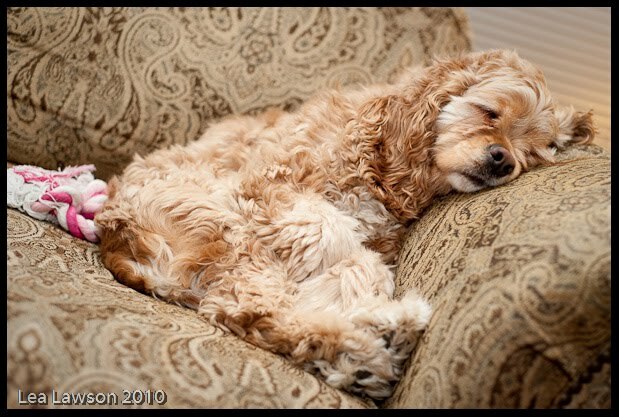 Cute photo of your pooch! You certainly know how to rock the bling ... ♥ it. Lea, love your blingy card!! Great job on your 2s4y card too!! Your cards are simply stunning. Very inspiring!! WOW, simply gorgeous cards! Love all the bling on the first one and the second one is so cute. Oh and the picture of your dog....so adorable! Seriously bling-tastic ♥♥!! And the baby one is soo adorable...as is your couch cutie! Of course, you MUST bling it up for your birthday! That blinged up present is too cute!! And the sentiment on your baby card is truly precious!! Your cards are wonderful, especially all the bling and the little feet. Adorable! Thanks for visiting my blog. I've been looking through your blog. Your work is absolutely beautiful!! Your dog is soooo cute too, it got an 'awwww' from both me and my 10 year old daughter! Lea!!! That card and your doggy are soooooooo stinkin cute! Thanks for playin with us at 2S4Y!!! I'm just stunned.. Gorgeous cards..!!! Love them both, especially the baby one.. I'm planning a baby shower for a friend, and these are the colors we are using..!! love those little feet.. You are very talented..! Great cards, Lea! Love how you used the bling and the pearls! Congrats on making the Fab 5 at 2s4u. And what an adorable pup you have! We are looking to add a pup to our little family soon. So excited! OMG, she is sooooo cute!!! She reminds me of my Lulu.